Bailiff Dan Music smiles behind the desk at the Highland County Common Pleas Court office. Music retires from his post on Friday. 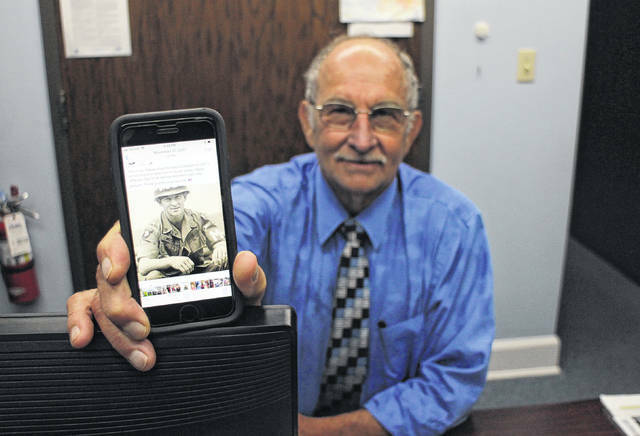 Dan Music displays a photo of himself taken during the Vietnam War, when he served as a door gunner and aviation inspector. He still loves to fly. 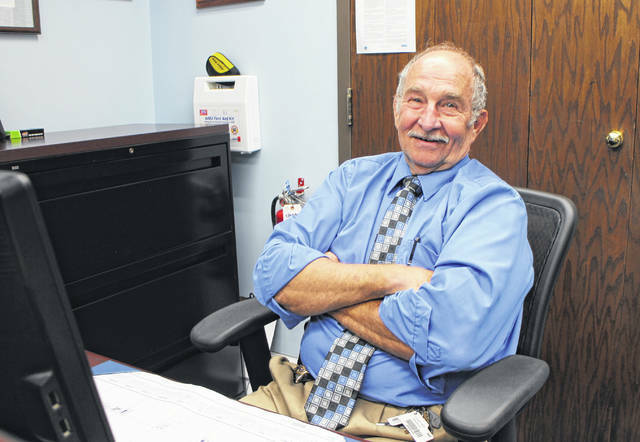 At the end of this week, Highland County Common Pleas Court Bailiff Dan Music, known for his kind disposition, calming presence and courtroom tackles, will hang up the cuffs for the last time after 10 years behind the desk. Music, a 68-year-old Vietnam veteran from Sugartree Ridge, will retire from his post on Friday so he can do more of what he loves — rebuilding and flying old airplanes, cooking competition-grade barbecue and spending time with his grandkids. It wasn’t long before the bailiff was flicking through photos on his iPhone, showing off pictures of planes he’s restored, interspersed with the occasional photo of a grandchild or memory from Vietnam. Music, a life-long aviator, began his law enforcement career here in the early 2000s when Ron Ward was county sheriff. Music said Ward brought him on board as a special deputy to form the sheriff’s office’s aviation program, which Music said was one of his greatest accomplishments. After continuing as a special deputy on road duty, Music was hired as bailiff in 2008. Music lauded Judge Rocky Coss and Office Administrator Marsha Oyer for being patient and easy to work with, and added that he’s confident in Bailiff Ben Reno, who will take over most of Music’s duties. Dan Strain of Greenfield will also join the team as a part-time bailiff. Coss said Music “has been a great bailiff,” and will be missed in common pleas court. Highland County Common Pleas Court Magistrate Cynthia Williams said Music has been “like a dad” to her. While being a certified law enforcement officer is not a requirement for being a bailiff, Coss said he hired Music because he wanted a “full-time professional law enforcement presence” in the courtroom. “Often times, when I’m busy, it’s hard for me to see what’s going on, and he’s been very good with keeping an eye on things that are going on outside of my concentration area,” the judge said. Music said his law enforcement experience has been helpful in keeping law and order in the courtroom. “You have to stay on your toes… We’ve had a few criminals get out of hand,” he said, adding that in one case, Music and other officers had to take down a defendant who made a break for the door while court was in session. “I was able to grab his feet before he got through the door,” Music said. Music said it’s been interesting to see justice carried out from beginning to end in criminal cases — from arresting lawbreakers on the street to sending them to prison from the courtroom. Music added that one of the reasons he became a cop was to follow in the footsteps of his son, Rob, who is chief of police in Peebles. “I guess I just wanted to be like my son,” he joked. But Music’s propensity for peacekeeping goes back further than that. Music said he issued his first traffic ticket in 1971 during a brief stint as a military police officer at Phu Bai Combat Base in Vietnam. The culprit, a Texas soldier tasked with driving a general around the base, was shocked at the citation, Music said. Not too long ago, the soldier got in touch with Music, and the two shared a laugh over the ordeal. The ticket, which the soldier has kept framed in his home, was never paid. Music said for much of his deployment in Vietnam, he served as a door gunner and aviation inspector, during which time he survived a number of crash landings. After the war, Music moved to Texas and worked in aviation there for some time, then came back to Highland County and took a few different jobs before becoming an aviation inspector at Airborne Express in Wilmington. He retired from there after 29 years, and soon after was hired as a special deputy. At the end of the interview, Music leaned back in his chair, put his hands behind his head and let out a sigh. “It’s going be strange, not having a job,” he remarked, adding that this will be the first time he hasn’t held a regular job since he was a youngster — but he admitted he never really left his youth behind. Music said he plans to continue working as an aviation inspector, a job he’s maintained in his spare time at the Highland County Airport, and will remain on hand if the court needs a spare bailiff. Music’s retirement will be celebrated Thursday with a reception from noon to 3 at the courthouse.